Managing your weight loss just got delicious with this vanilla-flavored meal replacement. An extremely healthy, low-calorie, nutritious source of your daily vitamins and minerals, with seven grams of non-GMO Soy protein. SECURE is a great tasting vanilla shake that, at less than 70 calories, also happens to be a highly nutritious ultra-low calorie meal replacement delivering 26 vitamins and minerals, as well as a healthy source of protein and fiber. Each delicious and satisfying serving contains only 63 calories and delivers 7 grams of heart and bone healthy non-GMO soy protein. For those counting "carbs", SECURE delivers only 5 grams of carbohydrate with 2 grams of healthy fiber. Plus, SECURE provides between 50% and 200% of the RDA of 11 essential vitamins, plus 14 vital minerals, including 250 milligrams of Calcium. Soy has long been a staple food in the healthy Asian diet and non-GMO soy protein is the highest quality non-animal protein available today, possessing an extensive list of research studies attesting to its myriad health and weight-loss benefits. SECURE makes it easier to enjoy a reduced caloric intake, while also ensuring an abundant supply of vitamins, minerals, protein, fiber and phytonutrients. SECURE is designed to be the best tasting, lowest calorie meal replacement available, providing a highly concentrated source of the vitamins, minerals, fiber and protein you seek without the abundant calories, sugar, carbohydrate or fat you seek to avoid. Nutrient-rich SECURE is designed to be more than the most extraordinary meal replacement on paper, but also the most impressive and delicious in your mouth as well. Controlling our intake of food can be difficult, but SECURE’s great taste and ultra-low calorie content makes it easy and enjoyable. These statements have not been evaluated by the Food and Drug Administration. This product is not intended to diagnose, treat, cure or prevent any disease. Mix one scoop of SECURE in 6 to 12 ounces of water, juice or non-fat milk. Use more or less liquid to achieve the desired flavor intensity. Secure provides a healthy, low fat and reduced carbohydrate source of protein that fits perfectly into any weight-loss or wellness plan. Secure can be used several times daily to replace meals, snacks or dessert, but be sure to consume at least one nutritious meal daily. Thank you for making protein palatable. I got lucky and grabbed the sale price of $169 for 300 meals. I am in Heaven. lol I add flaxseed, chia seeds and organic peanut butter powder to the Coffee and Chocolate. I add frozen berries to the vanilla. I can't wait to get the Pina Colada and the Berry so I can mix them and get a multiplicity of flavours. I ordered Secure because I wanted to loose a few pounds before I went on vacation. It works. I ordered the chocolate and now have come back to order other flavors. I mix the chocolate with water, organic peanut butter powder and ice, it takes like a milkshake. I also love to add a banana. Great meal replacement with amazing flavor. I use many of their vitamins and have never been disappointed. I can't wait to get my order for the other flavors. It's nice to replace a meal and loose weight with a product that taste great. Thanks Andrew for all your great products. I have tried a lot of protein drinks in the past and all have left a bad taste in my mouth until now! I love the vanilla flavor mixes well with strawberries, spinach etc. my favorite, take a 1/2 cup of Greek yogurt fat free, mix one soup of secure vanilla and you have the best of both worlds doubles your protein and most of all my 5 and 6 year old love it. I use secure mainly as my dinner replacement meal and have lost 11 pounds in almost 3 weeks. Several of my fiends are now believers and have ordered your product. I just retired from the military after 33 years and wish I would have had known about this product then. Thank you sir. I absolutely love the coffee flavor! I don't understand the negative reviews. Has a slightly sweet flavor that is not overwhelming. Yes, compared to the chocolate, the coffee powder has a texture to it. Ground coffee is gritty after all. But I use a blender bottle and mix with almond milk. Super smooth and so wonderful!! I love this every morning for breakfast. It has changed my life. Without a doubt, this is the best meal replacement/weight loss product on the market - bar none! I am a 70-yr old female and 5 years ago, I lost 80 ugly pounds using this product!! I am now a much healthier, active lady who works with horses 3 hours every morning of the year. I love the Chocolate the best, but Coffee is nearly a dead-heat! I make my "chocolate" in the early a.m. with HOT regular or decaf coffee, or mix it into a Smoothie with decaf instant coffee if later in the day, and it is not only a WONDERFUL TREAT, but leaves you feeling fully satisfied. Try it, you'll LOVE it too! I love these but I use them in a different way. I put a Tablespoon in my coffee as creamer. The chocolate makes it taste like hot chocolate mocha coffee. The coffee flavor makes it taste like Maxwell house international coffee flavor Café Francais. The Vanilla is my least favorite, but it works too. Better for you than creamers like Creamora and also has vitamins. I was so excited to get this on Friday (1/30). I have been drinking green smoothies and had another protein powder which was fine but was running low. I decided to give this a try, as I have used the vitamins before and had no issues. I was disappointed when I got the message from HSN stating that my shipment would not ship til Feb 12th, so in a pinch I picked up some protein powder at the local store. OMG it was so gritty I took it back after only using 1 scoop. I as so glad this came quickly. My sister was here and the next morning I made us both a frozen coffee. This stuff is so good, I want to drink it all the time. At night I use almond milk (frozen) chocolate Secure and PP2. I hope it goes on sale again at HSN when I run out of these. Pina Colada is the best tasting of all of the Secure meal replacements, Coffee runs a close second. I would like it Andrew if you would make this flavor available in the Whey protein powder as well....Thank you for all you do to keep us fit and healthy. This product is just as good as advertised. It mixes very easily and tastes great. I am on my second 100 serving container. However, I have looked and looked, but cannot find the amount of caffeine that is in one scoop. The ingredients say "coffee powder" but not an amount. Hopefully the amount of caffeine will be listed soon. I am on day 3 of my first experience with this product. Tastes fine, fills me up for about 3 to 4 hours, but the best benefit for me - no more diet soda cravings!! I have been addicted to diet sodas for years, drinking 3 to 4 a day. I crave them soon after breakfast and, if I don't have 1, I get headaches. Never made it through the withdrawals. Friday morning I had my first Secure Meal Replacement and I had no soda cravings - made it all day!! I haven't needed a soda since. That alone is worth anything I paid for the product. I don't know it works why but I am thrilled. yummy! I get the chocolate flavor. I love this. In the winter I use it like hot chocolate. In the summer I put it in the blender with ice and make a chocolate smoothie. Every morning I mix some with my coffee for a great mocha coffee. Who needs expensive coffee shop coffee when you can do it yourself? I know it's good for me, but it's delicious too. I HAVE BEEN USING SECURE MEAL REPACEMENTS FOR 1 MONTH NOW. I USE COFFEE AND VANILLA. I ADD A BANANA, ICE AND WATER WITH COFFEE FLAVOR AND MIX IN BLENDER EACH MORNING AND ADD FROZEN FRUIT AND WATER WITH VANILLA FLAVOR AND MIX IN BLENDER IN EVENINGS. I EAT ONE MEAL A DAY. IF I GET HUNGRY BEFORE BED I MIX ANOTHER SHAKE INSTEAD OF EATING THE JUNK FOOD THAT I USED TO EAT. I AM PROUD TO SAY I HAVE LOST 10 POUNDS IN ONE MONTH WITHOUT STARVING MYSELF. I JUST PLACED ANOTHER ORDER FOR VANILLA TODAY WITH AUTO SHIP. I AM SO THANKFUL THAT I FINALLY FOUND SOMETHING THAT WORKS. I NEED TO LOSE ATLEAST 20 MORE POUNDS AND WILL CONTINUE TO USE THE SHAKES FOR MAINTENANCE WHEN I REACH MY GOAL. THEY ARE SO DELICIOUS AND DOABLE. KEEP THE CALORIES AND THE CARBS AND SUGARS OUT!! I love it!! I've been taking all of the flavors for many years and now mix this with the new soy milks such as "SILK" UNSWEETENED, I can mix this with 1 scoop, 8 oz of unsweetened soy milk and ice and have 8 grams of protein, 104 calories, 8 grams of sugar, 8 carbs and lots of vitamins and minerals. As a gastric bypass paitent, this is the cats' meow...and it is good. I'd like to see more protein per serving without using 2 scoops (which adds to the sugar and calories) but for now it is great. I find that the little hand blenders are great for single servings. My husband, who is diabetic, loves the Pina Colada, and would like to add a shot if rum..... but it works great for him also. Good job...work on the increase for protein...and then hit the gastric bypass clinics as a source.. A little marketing could go a long way! I work full time, even though I just turned 70. I have excellent health, but was overweight. My job as a supervisor in a 24 hour pharmacy is very physical with lifting, moving boxes, building displays, etc. But I still needed more. Your Secure Coffee meal replacement, for most mornings, was what I needed. Easy, delicious, long-lasting hunger relief. And healthy. What more can I ask. Lost over 20 pounds. We do walk a 2 mile circuit during good weather also, and that helps. If anyone asks, I recommend your product easily. I found Andrew by watching HSN. I was seeking an affordable alternative to vitamins as many stores are too high pressure and very overpriced. I was impressed with his variety of bottle sizes to meet my financial situation at the time of order. I live on a very small amount and so appreciate the small options. I LOVE the pina colada shake. The pineapple is very sweet and tart and the coconut is smooth and creamy. It mixes completely in water and a shaker cup--no blender needed. And, if you can't take a vacation this year, it brings it to you! Pina Colada is the best!!! The pina colada is by far my favorite flavor in this line. It is so delicious blended with water, a little bit of ice, frozen pineapples and a frozen banana. I find myself craving this combination all the time. While I haven't noticed any weight loss during my months of using the product daily as a meal replacement (that applies to any flavor, not just the pina colada), I still appreciate having a low-calorie, healthy and nutritious option for satisfying my food cravings. Please keep it coming, particularly in the pina colada (I have no idea what I'd do if this flavor was ever discontinued!!!). I would also love additional meal replacement options made from whey protein. Thanks, Andrew!!! I now have dozens of flavor variations! After trying all the Secure flavors, I settled into my favorites-- vanilla and chocolate. But after more than a year of drinking Secure every morning, I was kind of sleepwalking through getting breakfast and moving on. Then I discovered the sugar-free syrups that coffee shops use (sold in grocery stores under DaVinci and Torani brands for example). I first bought flavors that I thought would go well with both the vanilla and chocolate, such as caramel, white chocolate, English toffee, brown sugar cinnamon, almond roca, chocolate chip cookie dough, French vanilla. I've been trying different combinations, and it seems that each is my new favorite. There is the added bonus that you can use the syrups in your coffee and to make Italian sodas (just add to sparkling water). The sugar-free syrups are made with Splenda, but for those who object to that sweetener, the sugar versions are a small calorie exchange for a big flavor burst. Now I really look forward to my flavor-enhanced Secure for breakfast each morning! Oh my gosh! So good! These taste just like an iced coffee! It's so yummy! I have searched every where to find a low carb meal replacement that actually tastes good ~ I don't have to search any longer! I've had every shake out there - whether it be whey protein or casein or soy and this is the only one I can actually feel a difference with - the protein is top quality, it mixes extremely well, tastes phenomenal, and I love the vitamins and minerals that are added...my only complaint is I wish the protein grams were higher per serving to match my needs as a 270 lbs bodybuilder...for someone who has trouble digesting red meat and dairy this shake is a dream. For making smoothies in my household, we put this Pina Colada Secure in the blender with strawberries, bananas, yogurt, orange juice and ice. Yum .... even my little ones want more of "Andrew Lessman Shakes" - their words. 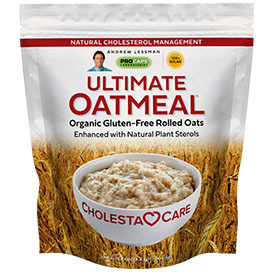 :-) Anyway, this is a staple in our household - along with Chocolate and Vanilla flavored Secure which typically I add to milk or Cream of Wheat cereal. Keep up the great work ProCaps Lab!! This shake is not only delicious is satisfying and curves my appetite. I really like it. Great taste and great price. Give it a try. It's really a great product. Too sweet, but still great! I almost gave this a lower number of stars because of the artificial sweeteners, but after listening to Andrew on Sunday. I decided if he is OK using it, it must be safe. I do think it is way too sweet, so I add coffee to it and that takes away some of the too sweet taste. Thanks for the great deal on HSN. What a great way to start the day. I mix it with yogurt fresh fruit and blend up enough for 2. It takes care of breakfast and lunch. LOVE...Love... love it. I only get the vanilla, because I can add whatever flavor I want. I have been trying to spread the word. I have a great green smoothie recipe. It sounds gross, but it really is good. I buy fresh berries and freeze them myself for my smoothies. 1 cup of OJ or an orange 1 cup of Water Big ole handful of baby spinach (rinsed) BLEND 1/2 cup of frozen blueberries 1/2 cup of frozen strawberries BLEND add 1 scoop of SECURE BLEND If I am extra hungry, I add a banana too. Don't let the spinach scare you, you can't taste it. Everything is very good for you. I can honestly say that if I drink one of these smoothies for breakfast, I don't feel run down in the afternoon. PLUS it helps with irregularity. I truly love the fresh flavors of vanilla, chocolate, mix berry, pina-colada soy milk. Plain mixing with mineral water is absolutely delicious, super yummy....I also come out with healthy-flavor milk shake. I always drink it with healthy-delight. Wow - I just found a new favorite in my daily Secure breakfast line-up: coffee & chocolate combined! A scoop of each makes an unbelievably good (and healthy) mocha shake! Some non-fat milk, a few ice cubes, and a few quick pulses in a blender....and you'll have the perfect breakfast shake! The coffee is terrific all by itself, of course....but try it combined with the chocolate - wow! As always, many thanks to Andrew and his staff for their wonderful products - you all truly enable your customers to lead healthier lives by giving them healthy choices! ANDREW THIS IS JUST LIKE GOING INTO AN ICE CREAM PARLOR AND ASKING FOR A PINA COLADA SHAKE. WITH LOWFAT MILK AND I USE A LITTLE WATER TO GET THE MIX GOING IT IS FANTASTIC. TASTE YUMMY AND IS HEALTHY FOR ME. THANKS 5 STAR PRODUCT. I just reordered this product again. Not only is this a great way to lose or control weight gain but it also tastes delicious and is full of vitamins. I put on about 15 lbs this winter and I know this will work in my determination to lose the weight. I used it last summer and lost 10 lbs quite quickly and never felt hungry. I have a shake in the morning, one for lunch and then a healthy low calorie meal for dinner (usually lots of salads with grilled salmon and chicken, some low fat yoghurt and some fruit). Note: I love the Pina Colada but find the coffee and chocolate flavors way to sweet for my taste. PLEASE ANDREW CAN YOU MAKE SOME OF THESE WITHOUT THE SWEET FLAVOR. I'D LOVE TO HAVE THE CHOCOLATE AND COFFEE FLAVORS TOO. This product is very good. Good tasting, mixes well and nutritious. I am not a good breakfast person. So, I started drinking this as my breakfast. I felt that was a pretty good start for my day. I reached a point where I just had to lose weight. A friend got me started on one of the "cookie diets". You eat six of these cookies per day and a nutritious dinner, plus lots of water. The cookies were tolerable, but, I still had my secure for breakfast. Then, I wondered how the Secure measured up, against the cookies. The secure came out ahead in almost every category. I was really bored with the cookies. Now, I drink the Secure 6 times per day and I am making this work better. Secure is lower in calories, higher in protien, has more flavors and I can even change it up by adding fruit now and then. I still have my lean meat and vegetables at dinner. This plan works much better for me and it is also a lot cheaper than the cookie diet. A friend gave me the vanilla flavored Secure powder to try last week. I decided that I would try it as a dinner supplement vs. a breakfast or lunch and save my heavier meals for during the day. It is fantastic! I will replace my dinner with a Secure smoothie, adding an 8 oz. cup of 1% milk, a banana & a few no-fat frozen strawberries Monday through Friday. This smoothie filled me up! I didn't want another thing for the rest of the evening. With the Secure smoothie and my exercise program, I hope to see some pounds shedding very soon! This was my very first time trying this and I'm so glad I did. It's very tasty and I love that I can replace my breakfast and lunch with a simple shake. Secure keeps me full all day long while other shakes I have tried leave you wanting more. It's also a wonderful pick me up in the morning with the coffee flavor. I will continue to order this one again and again. Andrew, you are the best for creating this! Thanks! The Vanilla Secure, by far, is my favorite out of the six flavors offered. All of the flavors are quite good, of course, but the Vanilla is extremely versatile (and it seriously tastes like a vanilla milkshake). I don't drink the Secure with water - I always use non-fat milk. With the Vanilla Secure, I also add some ice and some frozen fruit...and then quickly mix it in a blender. The result is an unbelievably great-tasting shake that is SO healthy; it actually doubles as a "mini multi-vitamin". I actually look forward to drinking this every day for breakfast. Thank you for offering such a healthy product. By making it taste so good, you've made it very easy to use Secure on a daily basis. The Peanut Butter Secure is excellent! It has a definite PB taste...but it's not overwhelming (so if you're concerned about that, don't be). I use all of the Secure flavors with non-fat milk and some ice in a blender. With the PB, I add frozen banana to it as well - and it makes a terrific shake! Thank you again, Andrew, for offering several different flavors of Secure. For those of us who need to drink it every day (either for dietary issues, extra protein, weight loss, etc. ), the different flavors keep us from getting bored! The Mixed Berry Secure is quite good. I know that Vanilla, Chocolate, and Coffee are Andrew's top-sellers...but I wanted to try all 6 flavors. I have Secure every morning for breakfast, and I tried the Mixed Berry with non-fat milk, ice, and a few frozen strawberries. I mixed it in a blender...and the result tasted like a strawberry shake! Definite "thumbs up" on this one, Andrew! Thanks for a wonderfully healthy product! As I've written in other Secure reviews, I can't get over how good this tastes! It's SO good, in fact, that it's hard to believe it's healthy - that I can actually drink it without feeling guilty! Chocolate is my 2nd favorite flavor (running neck & neck with Pina Colada)...Vanilla is my favorite (it's extremely versatile). If you want something that tastes great, give this a try! I add a scoop of Chocolate Secure to some non-fat milk, ice, and either a few frozen strawberries or half of a frozen banana...blend in my blender...and it's like drinking a milkshake for breakfast! Wonderful product - thank you so much, Andrew! This is a TERRIFIC product! I've been drinking Secure for a while now...with Vanilla being my favorite flavor and the Chocolate being my second favorite. I've just tried Pina Colada - and all I can say is "WOW"! I think that it might have just displaced Chocolate as # 2 on my list! It's wonderful! I drink Secure every day for breakfast. I add some non-fat milk, a couple ice cubes, some frozen fruit...give it a quick whirl in my blender...and it's a delicious (and HEALTHY) start to my day. Vanilla is still my favorite because of its versatility (and the fact that it tastes like a vanilla milkshake)...but the Pina Colada has a terrific coconut flavor to it. I added half a banana to it, along with the non-fat milk and ice...and the result tasted so good that I had to remind myself that it was healthy! Thank you, Andrew, for yet another wonderful product! I will definitely be ordering more of the Pina Colada flavor (I already have a stockpile of the vanilla & chocolate...lol). I am truly grateful to you and your company for providing wonderful tools for a healthier lifestyle! The vanilla Secure is a great product. I have it on auto ship. I mix the vanilla with peanut butter secure with banana and chunky peanut butter and it taste awesome love that stuff. I also have several products on auto ship,all the products are great. I must say Andrew and ProCaps Labs run a great first class operation with out a doubt. Thanks again Andrew and ProCaps Labs for making great health products. I will be a long time customer, thanks again. The Secure peanut butter is a great product, it taste great when mixed with chocolate Secure and almond butter. I like the fact that you put a lot of vitamins and minerals, soy protein. I have it on auto ship. 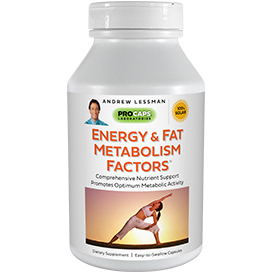 Andrew and ProCaps Labs you out did yourself on this product, this is the best ever. Andrew you and your staff are so very great, so thanks again Andrew for the great health products you make. Bill FL. I ordered the 20 meals from HSN in chocolate. It tastes great. I'm almost out and need to order more, because I drink it all the time because it tastes so good. It tastes great with hot water or milk. 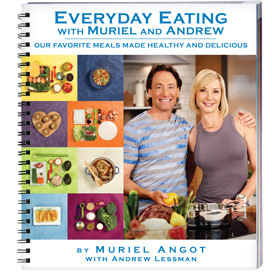 I wasn't sure at first, but have watch Andrew for years on HSN and figure I could trust his products. I Love it- Happy Customer in OR. The chocolate Secure is the best I ever had, it is a great product. I have it on auto ship along with vanilla and peanut butter. I like the fact that you have a lot of vitamins and minerals and Soy Isoflavones. The chocolate tastes great with almond butter. Thank you Andrew and ProCaps Labs for making great products. Thanks again Bill Fl. I 'm addicted to the chocolate and now the vanilla too. I love this flavor also. I can't say this enough. I have been buying Andrew's products for years now and I think they are all great. 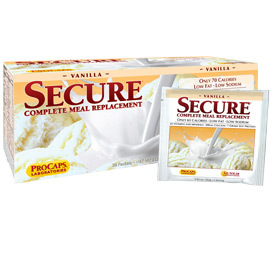 I first saw ProCaps' Secure meal replacement on HSN and decided to give it a try. It's been a week and I've lost about 3.5 pounds. I've replaced lunch with Secure (only during the weekdays, weekends I eat what I like). Taste good (better with cold water I think), dissolves easy, slight amount of grittiness (maybe from the fiber). Anyway I'm a fan of Secure now. Going to order straight from ProCaps, save on waiting and tax. I have almost all of the varieties of meal replacement shakes to keep me motivated and on track with losing weight. These shakes will give you the willpower & motivation to stick with your diet if you vary the flavors of the shakes. I have one shake for breakfast mixed into non-fat milk and ice, and another for dinner. My favorites are Chocolate, Vanilla and Coffee, but I also have the Pina Colada too. You can lose a lot of weight (2 to 5 pounds a week) with SECURE. I thought chocolate, coffee and vanilla, would be my favorite favors, I prepared this today and WOW was it good. I use Welch's grape juices as a base about 1/4 cup, then added 6 frozen strawberries, 1/2 cup of ice and 1 packet of Secure Mixed Berry. Oh my Gosh it was soooo, soooo delicious, low calories and healthy. So glad you're making this Andrew keep up the good work. One note the chocolate, coffee and vanilla are excellent, but I'm glad this one taste great as well....nice change of pace. I decided to write a review since I found the reviews so helpful in making my decision to try the product and boy am I glad I did!!! Thanks to all of you who took time out to write reviews. After reading every single review on the site (lol), I settled on Pina Colada, Vanilla, and Chocolate. Although the Vanilla and Chocolate are good, the Pina Colada is my favorite by far!!! It tastes great and knowing that it's also healthy, makes the thought even better. I drink mine as a Smoothie by mixing it with frozen mixed fruit (strawberries, pineapples, mangos), crushed ice, water, and a hint of lemon juice from lemon concentrate. Makes for the perfect morning start. Also great during these hot summer months in Texas! Great product Andrew! Thanks!!! This flavor is absolutely amazing!! I don't know how Andrew can make a protein powder taste so good & be so low in calories & fat yet full of nutrition, vitamins & minerals, but I hope he never stops selling his Secure Meal Replacement. I use this flavor as a base for endless varieties of fruit smoothies in my blender. It's good with just water & ice, but I love to add some V8 Splash Tropical fruit-vegetable juice, and a variety of frozen fruit like pineapple, banana, peaches or mangos. Sometimes I add a bit of fat-free yogurt for extra protein & calcium boost & to make even more filling. It's also very satisfying, especially on a hot summer day. (P.S. Try the peanut butter flavor...it's FABULOUS & makes my absolute favorite smoothie with skim milk & a frozen banana). I never go without the vanilla-flavored Secure. I left a review for the chocolate as well...but vanilla is the flavor I would choose if I could only have one. As some of the other reviewers have commented, it makes a wonderful base for ANY kind of fruit smoothie. It's what I have for breakfast every morning. My favorite breakfast is one scoop of vanilla Secure in a blender....add a couple ice cubes, skim milk (probably around a cup), 4 or 5 frozen strawberries, one scoop of vanilla-flavored egg & milk protein powder (16 g of protein per scoop), and half a scoop of unflavored soy protein powder (12.5 g of protein per half-scoop). I then open up a capsule or two of Fibermucil and dump it in. Blend until thoroughly mixed and enjoy! It's a healthy, delicious breakfast smoothie that has approximately 35 g of protein. Since I don't eat lunch, it really keeps me going through the day! Thanks, Andrew! Please don't ever stop making your Secure products!! No matter what age, it is great!!! I am 71[and] needed to take off about 30 pounds. I saw [Andrew Lessman] on HSN, bought the Piña Colada and the Chocolate in the big jars. I have lost around 15 pounds and feel so much better. I also have osteoporosis and have been told by my doctor to increase my calcium, so the calcium in the SECURE is a side benefit. I have a shake in the morning: chipped ice, water, 1/2 cup of dry non-fat milk, and add banana and/or berries, and it is very good. I would highly recommend this to anyone, not just for weight-loss help, but just a great way to have breakfast. I have also had a shake for lunch at times. Anyway, I am ordering the variety pack to try different flavors, but I love my Piña Colada!!! I just received this had to try since I miss peanuts/peanut butter in my diet. WOW!!! Andrew you did it again!!!! I make it with water, ice and 1 packet of Truvia and 1 packet of sweet & low. This maybe too sweet for some of you so adjust the sweeteners. Making it this way takes me back to my Dad making peanut butter candy for us. Please continue to make this flavor!!!! I have tried the variety box & the peanut butter & pina colada are by far my favorites...both are so delicious! The peanut butter flavor is so unique in a protein powder product & it really does taste like actual peanut butter! My favorite way to make it is to blend together with skim milk, a frozen banana & a few ice cubes...makes a thick & delicious peanut butter-banana smoothie. Very filling too! If you are a peanut butter lover, you MUST try this flavor! YUMMY! I ordered this product via HSN earlier in the year and I love it. I mix it with a banana and milk and make a very filling milkshake out of it. I am very glad this product is available direct from the manufacturer. I will try the vanilla as well seeing that it is very popular. Thank you Andrew! Andrew, you're the bomb! I started using this product when you offered it on HSN. I make a shake with it in the morning with low-fat milk & protein powder. The taste is phenomenal, it dissolves easily in a shaker or blender & it makes you feel you are having a high calorie drink without the guilt. Along with sensible eating & 30 minutes a day of cardio workout, I have lost 40 lbs in 6 months using this for breakfast every day. I love the chocolate too but coffee is my favorite. Too bad HSN doesn't offer it anymore but I'm thrilled you have this website for easy ordering. I also use your Chondroitin/Glucosamine & Women's Complete. Your products are the best & the information you give is priceless! Keep on keeping on & God bless! Pina Colada is my favorite meal replacement. I can have it plain with ice and cold water or blended with frozen fruit. I love the coffee flavor for breakfast; however, the Pina Colada is great for mid morning and mid afternoon during the summer time. Please keep making it. It's the best ever. My whole family loves it. I purchased this product at HSN and was in panic mode when I couldn't find it there. I am so glad it is available through this website. I mix it with frozen fruit also and it is one meal replacement product that is smooth and not gritty. I have a very hectic schedule and it is the perfect quick meal. Thank you for keeping this product available. I truly enjoy this product. The pina colada is delicious. As the other review, I also add pineapples and/or strawberries. Even without fresh fruit it's very tasty and not chalky at all. I use it for breakfast and sometimes for dinner (especially if I've had a late lunch). Although the pina colada is my favorite, I also enjoy the vanilla and chocolate. I hope this product is available forever. This is a must have product! I cannot get thru even one day without this. I use this in coffee in every cup I have during the day. I have one shake in the am and one in the pm as well. I don't drink milk I drink this. I use it not to lose weight but for the taste and the benefits of the soy. I mix 3 flavors, chocolate, vanilla and coffee. The chocolate is like a little bit of heaven. It even smells wonderful I'm such a chocolate person this more than satisfies my need to have it. Love this drink. My 14 yr. old grandson has adopted this as his favorite drink, with a banana mixed in. Very disappointed that you no longer have the 160 serving size that you offered a while back on HSN. Will you ever have this size again? Pauline in MA. Delicious! And at only 70 calories you can have two sometimes as a snack or w/ a healthy meal. I bought the pina colada, it was good. I have chocolate and coffee now, they are ok, but the vanilla is the best. I lost almost 30lbs on it combining it w/ lots of praying (have high blood pressure - need to lose weight and get healthy), walking and cutting back calories. But went out of town for a week during Thanksgiving and have not been disciplined to seriously start again... and I ran out of vanilla. So I am ordering today and plan to start back on a program that includes the shakes, walking, eating right and prayer! I recommend this product. Plus I love that Andrew has made his lab/factory green. 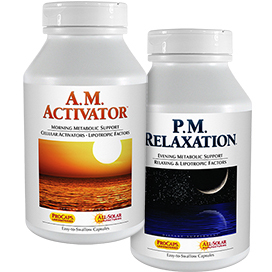 This product gives me a lot of energy thru the day. I work 4 days a week 12 hour shifts in a kitchen. I went a week without taking this and I felt the difference. I take it with skim and I open 1 capsule of the high potency B-complex in the mix. I recommend this to anyone. I bought the large container from HSN when it was a Today's Special Value. I keep my container at work and prepare a frozen fruit shake every morning. I use a sugar free blueberry yogurt or some other sugar free fruit yogurt and mix in frozen mixed berries (which I buy very economically from my Costco store). Using the frozen fruit is actually better than fresh because the fruit never spoils. Sometimes, I mix in a little pomegranate juice or purified water. I am now making these delicious and healthy breakfast shakes for my co-workers. We all have a few holiday pounds to put behind us, and this shake keeps me satisfied until lunchtime. I look forward to trying the variety pack and am especially looking forward to the Pina Colada flavor. I love this stuff. It is great on its own, or an add in when making a smoothie! Just add frozen fruit and milk and voila, you've got yourself a dessert that is actually healthy. Thank you Andrew. I ordered this from HSN when they had it as their Today's Special, and I am totally addicted to this. The only problem I can see is that I might not be able to stop drinking it!!! The Chocolate is amazing. I usually mix it with non fat milk. The Vanilla choice is great too, as you can make fruit smoothies with frozen fruit that are actually healthy!! The added bonus of vitamins and minerals is wonderful. I take several of Andrew's supplements, and all of his products are top quality and I would not purchase vitamins from anyone else. Thanks Andrew for all of your wonderful products. I give this item five stars for the great taste. I'm a chocoholic and have tried other chocolate protein shakes that can't even compete with SECURE. The best thing I ever did for ME! I purchased Secure for the first time Sept 2007 and have had a shake for breakfast (which I use to skip) and 1 for lunch or a snack. I have lost over 50 lbs. and the best part I have kept it off and love the taste. When I use it for a diet I have a shake for breakfast, Lunch with a salad, a 100 cal snack and dinner and consistently loose weight. To maintain, I have my Breakfast shake, an AM snack, Lunch, Afternoon Shake, and dinner. Honestly, I love this shake it is a great source of vitamins that I normally would not get! If you love a Frappachino you will love this shake! I’ve been getting vitamins from ProCaps Labs for a decade so I thought I’d try this meal replacement. I’ve mixed both the chocolate and vanilla with soy milk and I’m very impressed with the taste. Over the years I’ve tried similar products and none have tasted a good as this product. Thank you Andrew. I have my 91 year old mother on this stuff and she loves it. So much better than the Ensure. I mix it with soy milk and she has it in the evening. She really enjoys it and I know that I am giving her some good nutrition. I drink it in the morning to start my day. It tastes so rich and creamy. It helps me get the protein I need since I am a vegetarian. I do so love ALL the flavors . I mix it with sugsr-free DaVinci syrup yummmo / However , I agree with James from NY - PLEASE try to add more protein . I am a wls (Weight Loss Surgery) patient and need as much as I can get . I absolutely love the taste of this protein - even in water it still tastes better than any other protein I have tried. I am a bodybuilder and this has become my staple as a meal replacement. I just wish it had more protein per serving because I am going to be running through jugs very quickly - I am addicted to the taste!!!!! After trying so many drinks, I've finally found a drink which actually keeps me full, while being nutritious as well as tasty. And I've also lost a few pounds!! When I first received the peanut butter secure I really wasn't happy with the flavor, but I tried it a second time and I now love it. I mix it with a banana and crushed ice and also mix it with low fat milk. It fills me up and also gives me energy. I am on order for a shipment once a month and I am so happy with this product. Pina Colada is my favorite of all the Secure products! I mix half of a banana, about 1/4 cup of non-fat plain yogurt, some ice and a few chunks of pineapple in it's own juice in my mini blender with one scoop of mix and it is wonderful! I feel like I'm drinking a high calorie shake when in fact it's something that is very good for me. Can't beat that!! Makes a healthy, great tasting smoothie! What a wonderful tasting product. I make a smoothie with this. Add a light yogurt and some fruit, ice and some water, or milk, and you have a delicious healthy smoothie. Strawberry, peach, blueberry, whatever flavor you want. My kids just love these, and I don't mind making them for them, because they are so healthy. I have a little Mrs. Kitchen blender, and in 1 minute it is all ready to drink. I absolutely love this product. It tastes wonderful, low calorie, low fat, low carb, mixes so easy, what else could you want? I'm so glad I decided to order it. I've tried all the flavors thanks to the variety pack. I currently have chocolate, vanilla, coffee and pina colada on auto ship. I usually have a shake for breakfast with fruit and then another for a late night snack .My whole family loves them all .....even my grandchild. Thanks so much for this product. I am a customer for life. I rate this 5 stars. For me it has taken awhile to see weight loss but in the last 30 days I am down 10 pounds. It works really well as a meal replacement if you mix it with another drink, not just water. And for quick mixing get a tumbler shaker. A blender is not always necessary. I would recommend chocolate and coffee as a personal preference. Love it ~ drink it twice a day! 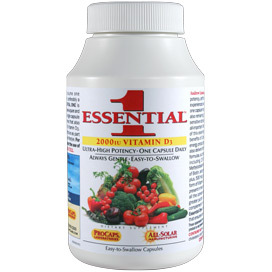 It's almost impossible for me to get my wife to take vitamins and nutritional products. BUT...she is a coffeeholic. Now this is her beverage of choice for breakfast. She enjoys it and I know she's getting the added benefits of protein and vitamins that are in it. We love this product ! My husband loves the Chocolate with a banana. He has it almost each and every day. He doesn't have the time for regular lunches and uses it for a midday meal replacement. He says on the days he doesn't have his Secure Meal replacement by late afternoon he feels run down and doesn't have the energy he needs to fulfill all the activities that he enjoys. For myself... I have found this product to be a life saver. It combats the fatigue that I deal with and gives me the energy I need to be able to enjoy life in a much greater way than if I didn't have this product... Thank you for this and so many of your wonderful products Andrew. The peanut butter flavor is my favorite. I know it if I forget to mix it in with my favorite smoothie. I miss the great taste and all the benefits. I like it too that it has the soy ingredient that I need. Great tasting, and best meal replacement drink I've ever had. And believe me I've tried LOTS of them. Great for a quick breakfast or lunch on the go, or maybe just not that hungry but don't want to skip a meal. I plan on to continue to use this product as part of my every day diet even after I lose the weight I want to lose. My husband swears by this product. He is very picky and has a hard time with his digestive system so he doesn't always eat a good breakfast. This product has proved to be a lifesaver for him. We mix it with orange juice and put it in the blender. He absolutely loves it! We have tried other flavors but the vanilla is the best as far as we are concerned. This product tastes great... there is real cocoa powder in the mix. Easiest to blend in a shaker cup rather than stirring. Mixed with nonfat milk it tastes exactly like Nestles Quick. Haven't tried mixing with water, might be a little watery. I am a very big fan of the Secure products (I keep the bulk containers at home and the individual packets at work). I use the chocolate, coffee, and vanilla. I've tried the other flavors and they all taste good...but those three are my favorites. I typically use skim milk when making my drinks - but water works well too (I simply like the taste better with milk...and it's more filling if you're using this in place of a meal). Great product...affordable pricing...convenient packets (which is just one of the BEST things that Andrew has come out with). On top of the great taste, this product is actually good for you - it's almost like taking a mini multi-vitamin. Highly recommended!! I can't resist mixing the pina colada with fresh pineapple and strawberries. What a treat! Who needs ice cream when you can make such a healthy and tasty smoothie with Secure, milk (I use soy or rice milk) and frozen fruit. I always have a Secure smoothie for breakfast and frequently have it as dessert at night. I tried most of your flavors but I love the Coffee and Peanut butter. I first used Milk to mix it but after a call to your office, you said water is better and mixable. I now mix it with water and it's delicious too. This has saved me many times due to high glycemic problems and too much candy. I drink this and the protein straightens me right out. Thanks Andrew for all your hard work and dedication. I would like to know what products you and your family personally use. I love the coffee flavor even though I'm not a coffee drinker. I mix a packet with soy milk, a little vanilla frozen yogurt and ice in the blender to make a frozen treat. It's filling and I don't feel hungry until the next meal. And since Andrew has put a lot of vitamins in it, it helps me out on days when I get busy and forget to take my Andrew Lessman supplements. This is an easy and painless way to cut back on calories and lose weight. I've already lost 5 pounds. Thanks Andrew! My mom ordered this for me because I’ve been trying to lose weight. I am always on the go and have no time for eating right. This great tasting shake came along and I was hooked. I love coffee and this shake is no exception, except for the fact that I feel better after drinking it, without any guilt from those other coffee chains out there where there is over 1 thousand calories in each cup and that’s not counting getting a Large/Venti size. My mom got me the tub and it’s perfect. I use one scoop for a snack and two for a meal. It keeps me satisfied until my next meal. It is also helping me with portion control. I’m trying to work my way down to only having one scoop per meal and a half a scoop for snacks. This is the best tasting and satisfying drink on the market. I know, I’ve tried them all. Thank you so much Andrew Lessman for making this and thanks a bunch mom for buying it for me. You're both awesome! I love this product. I started out mixing with water as I knew if I started with milk would never go back to water. I was surprised as I expected to it to be bad but I trusted Andrew and glad I did. It is just fine with water and mixes well. For a special treat I mix with low fat milk and wow is that great. For years if I wanted to purchase meal replacement I could never but Chocolate as the taste was awful. Can not tell you what a nice surprise Secure was. Now I drink with water most of the time to save on calories. I also have the Vanilla on auto ship to my son. I keep the Coffee at work and mix with water as well for when I am getting just a little hungry. Great product. Please do not ever stop making this item. I've been using all of the Secure complete meal replacements for several years(even before it was reformulated) as a snack/meal replacement. I could never get my husband to even try them until Andrew introduced the coffee flavor. This is now a staple in his diet. Due to health reasons he needs a good source of protein without the added calories and this drink is perfect for him. Thanks Andrew! I love to mix the peanut butter with chocolate or coffee. This is always the first flavor that I run out of in the variety pack. The smell is wonderful and is so yummy with skim or soy milk and frozen fruit. I know this is the least popular flavor but please don't ever stop making it! I am unable to drink coffee because it seriously upsets my stomach. So I am very surprised that I am able to drink this with no tummy upset. The smell is heavenly and the taste is amazing. I love to mix this with either the peanut butter or chocalate flavor, milk and a banana. Will not be without this wonderful product!! Love it, love it, love it. I have to say this is the best part of my morning! I make a secure smoothie every morning with soy milk and frozen fruit. My entire freezer is nothing but frozen fruit devoted to my secure smoothies. I sometimes make one in the evening as a desert. I bought 4 boxes of this ( Coffee/Pina Colada ) when it was on Today Special on HSN and have used it for Breakfast , Lunch and in between meals and honestly I was surprised that it actually taste like a real coffee drink whether you mix it with fat free milk or water !! I drink this religiously in conjunction with Carni Slim and AM/PM Activator/Relaxation Kit with diet and mild exercise ........and the result ? I lost 8 lbs in less than a month !! Also this is great for snack whenever you have cravings for sweets ! This product really works !!! I ordered this product off HSN about a year ago and I love it. I found it was hard to mix with water but started using it with fat free organic milk and it was great. Keeps you full, tastes great, and really helped me in my weight loss mission. I have been using the meal replacements for many years. This mixed Berry was not too bad - definitely not too sweet. It really tastes more like a flavored vanilla drink. The flavor is not great but not bad at all - I would purchase it again. The reason it has four stars is that it seems that the flavor/taste of these meal replacements has gotten worse over the years. They used to be really good. Not that they are bad, but not nearly as good as they used to be. Not sure why that is. I hope someone from Procaps reads this. Procaps used to make a shake I believe was called a "Fat control" or "Weight control" shake that only came in vanilla. It was bar none the best shake I ever had. I wish your could bring that back. I would be your best customer. If you by some chance still have this under a different product name that I am just missing PLEASE let me know. Love this Product and I am Back for More! I started using Secure in 2011, was just lbs from 300 lost 80 in the 7 months I was on it and ended up getting pregnant so I had to stop it for a while because the doctors were not sure about the product, they said there was not enough information to review. Anyway I delivered my first and last beautiful healthy baby in August of 2012 and I am starting the new year off for myself and getting back to using the Secure Meal Replacement. I should add that I did not gain back any of the weight that I lost when I was using the Secure Meal Replacement during pregnancy and actually weighed less the day after I delivered than the day I found out I was pregnant. Being 46 years old, diabetic and overweight were all obstacles and by using Secure I truly believed it got me to have better eating habits, helped me lose weight which caused me to feel great. I can't wait to get my order to continue losing again. I want to be healthy so I can see my little one grow up and at my age I will need all the help I can get. Don't need 'em. Don't want them. I would prefer less sweet than it is. If people want it sweeter, let them add their own sweetener or fruit juice. Thanks. Otherwise, I really love it. I am a very lazy person and always hated the fact that I had no will or energy to workout. People always told me to workout because I would like the feeling afterwards; truthfully, I hate that feeling afterwards because I feel like I want to go eat a cheeseburger or something bad for me. I recently wanted to do something about my weight and decided to try these shakes. I got the chocolate, coffee, mixed berries, and pina colada. I really only like the chocolate and coffee and mixing them together is amazing! The chocolate is nice and sweet and great for dessert for me and coffee, it actually helped me stop drinking coffee and tastes just like the way I make my coffee. I recently got them and they actually make me want to start doing my zumba workouts. Although you have to drink them fast before they chalk up at the bottom, they are very good, a great way to slim your hunger, and eat better. I've been trying them out for less than a week and not even working out yet because of school and work, but the results are amazing. I have one shake for breakfast and one for dinner, with whatever I want for lunch, and then I juice for dessert and within less than a week with no working out, I've lost seven pounds. It's amazing and I highly recommend it to anyone trying to lose weight. My cousin gave me a bottle of this to try, and I loved the fact that I wasn't hungry an hour after drinking it, and it didn't have an artificial sugar taste. I ordered my own, and I'm disappointed in the taste, there is a defined fake sweetener taste to it. The caloric claim on the label has changed also, from 69 to 77. Something in this recipe has changed, and it's not an improvement. Please go back to the old formula! I have been enjoying Secure Coffee for well over a year. Two scoops mixed with 1/2 skim milk and 1/2 cold water is my breakfast every day. Yummy and keeps me going til lunch. The last bottle that came (on auto delivery) had a slightly changed taste. Still good to drink and satisfying but I prefer the original taste. Taste is the only reason that I held back one star. I love the taste! All the flavors are good. I wish they would sell the sampler packets; so you could have all the flavors at once. YUM!!!!!!!!! Need I say more. I really liked these but they give me a headache. I think it is from the Acesulfame Potassium. Wish they didn't because they are really good. I drank it with fat free milk. Tried it several times but got a headache each time. Even though I'm not suppose to have soy since I'm hypothyroid I would have still drank these if it was not for the headache. If there was a solution for that it would be great. NICE CHANGE FROM THE ORDINARY!!! This one is very interesting in the fact that since it is a combination of 3 berries- not one standing out, it is very good (not favorite). I blend with 16oz water, 2 scoops of Secure, ice, 1 packet of Truvia and 1 packet of Sweet & Low. This makes it sweeter than many of you may like so adjust to your taste. Was not happy with the taste of the chocolate at first but I found if I mix a little of my leftover black coffee, ice and some fat free evaporated milk in my mini blender with a scoop of the mix it tastes like an expensive coffee drink without the cost or calories!! Fat free evaporated milk is a great substitute for cream in a lot of things. I tried this product for the first time this week, (Peanut Butter flavor) and was very pleased with the taste, tastes like Peanut Butter! I was expecting a very "vitaminy" taste, and that was not the case. This is a very doable program. Just bought some more... I also felt that it regulated my system back to normal somehow, just felt better on it. I find my weight fluctuates.I love the taste of the vanilla and esp. the coffee. chocolate is still not used. It is not too hard to mix with my yogurt but at times I don't find it filling.I also take steroids , etc. ONE SIZE DOESNT FIT ALL!! We have to remember that. Best of luck for you!! Congrats to those who lost weight. Andrew does not endorse it as a weight loss product. As a registered dietician, and physician assistant, I practice what I preach by eating extremely well, exercise, and l consume a number of Andrew's incredible vitamins and supplements daily. I purchased this product as a "dessert" or snack after hearing Andrew discuss its nutrition benefits on air. I liked when he stated this current formulation tastes like 'melted chocolate ice cream," and the host also gave me a wonderful idea when she said this product plus boiling water makes "delicious hot chocolate." I looked at the list of ingredients and wished there was more protein but I thought it would still be great tasting snack or once in awhile, a meal replacement. 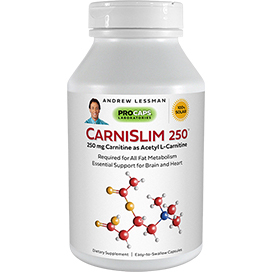 I did not notice the additional ingredients below the main list, primarily because I didn't feel the need to scrutinize as I have always trusted Andrew Lessman's products. I did, however, just notice the list of ingredients "below" the main list shown, and I was shocked to see fructose listed as the SECOND ingredient, normally meaning higher content. Furthermore this product contains Acesulfame K/Potassium and Splenda. 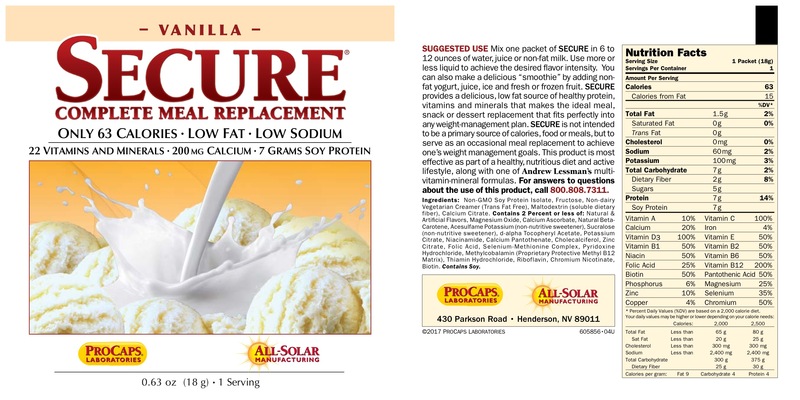 There are many experts who believe Acesulfame K should be re-tested due to health concerns. This information is clearly stated in abstracts (scientific papers). In fact, Pub Med/NIH has a paper titled "Testing Needed for Acesulfame Potassium, an Artificial Sweetener." Yes, I love the taste of this product, especially as "hot chocolate" when mixed with boiling water, but unless the ingredients are revised, I cannot allow myself to consume this product. Andrew is still my hero in the world of nutrition, but I felt down when I saw the Acesulfame K. Maybe one day this will be reformulated and still taste delicious! Compared to vanilla & chocolate which mix completely, the coffee has a gritty texture I can't get past. I mixed with almond milk. Now I just add instant coffee to the chocolate secure and its really good. I bought 2 big jugs of the protein powders and although they taste pretty good, I don't think I'll continue to use them again. At a time when there is so much out there about the side effects of Splenda and being that there are so many natural alternatives out there like Stevia (now legalized), or sugar alcohols like Xylitol, why does Andrew continue to put artificial sweeteners (Splenda) in the Secure shakes? Many companies have started to put alternative sweeteners that are better for people 's health in their shakes. Why in heaven's sake, would a reputable and innovative vitamin company like yours put artificial ingredients in a "health" product? I respect all the work Andrew has done. Please continue to pioneer the path for health and prosperity in innovative products that don't cut corners. Please reformulate the Secure drinks by taking out the Splenda. This is the answer to my not taking the time to eat. I like the coffee drink. I make it with a cup of coffee, ice cubes and 1 packet and I'm out the door. I was very dissapointed to see artificial flavorings. I really wish you would consider a natural sweetner and flavors and you would really have a winner. Not sure I will order again because of this. Let me preface this review by saying that I THOROUGHLY love Secure meal replacements -- they were a life saver for my cousin & me earlier this year! We tried them for the first time at the beginning of the year, ordering them through HSN. We ordered chocolate, vanilla & coffee. We found them on our patio doorstep on the morning of Jan. 16th, and since we were leaving for work, had no time to open the boxes. We placed them in big plastic bags and looked forward to opening them that evening. Unfortunately, we got home that evening to a flooded apt. -- everything was under two inches of water from a broken water heater seal. We only had time to find and "secure" our 3 cats, then call for emergency maintenance. Upon leaving our apt., we took only our cats, a change of clothes -- and we picked up the boxes of Secure. The following week saw us 1) homeless; then 2) placed in a temp apt. ; & 3) working feverishly to get our stuff out of our apt., into the temp place & into our new apt. There was literally no time to eat -- and so we broke open & tried the Secure. That sustained us throughout the duration of the emergency, plus during the time it took to get settled into our new place. I couldn't wait to order the mixed berry, so we ordered the variety pack. Sad to say that the berry flavor has a "soapy" taste, to me. My cousin is a peanut butter freak, and she was disappointed in the peanut butter flavor. The other flavors are DELICIOUS. We each have jobs that keep us busy and don't always allow for lunch time; not a problem with Secure! Needless to say, with the exception of the two "problem" flavors, we are hooked! It's great to know that we are getting the nourishment and vitamins we need in something that tastes sooo good! Have been a very happy chocolate or vanilla Secure customer for a long time. Thought I'd try something different. Big disappointment. Super, super sweet with a strong artificial flavor. Couldn't identify any particular fruit....a combination of chemicals with lots of artificial sweeteners. I spoke with Customer Service today. She asked if I had any recommendations for improvement that Andrew could look into and I suggested he review this flavor and perhaps use less artificial sweeteners. For now..I'll stay with chocolate or vanilla! Andrew how can you put neurotoxins in this product and not be upfront about it. I purchase many of your products and was surprised to find out, after having reactions from using this product, that it contained sucralose and acesulfame potassium. The same thing as Splenda and Aspartame. I will be contacting ProCaps to get a refund. If I would have know upfront about these ingredients I would never have ordered them and would definitely never put them in my body. Now I am questioning all the rest of your products. Buyer beware! I wanted to give this no stars but it wouldn't let me submit without selecting at least 1 star. I've been drinking coffee Secure shakes for many years and have always enjoyed them. The last container is different, texture and flavor. I know it says nothing has changed, untrue, as the calories have increased. A breakfast I use to enjoy has now turned into yuck, I'll just finish the container and not reorder. I made multiple purchases of this product and was very, very happy with it. However, the last shipment I received is horrible. It leaves a nasty aftertaste, you can barely taste the coffee flavor. Even the consistency is different. The blog claims there is nothing different about, but that is an untruth. I won't be purchasing this again. For YEARS, I've used your shakes and have loved, loved, loved the Coffee. I purchased the TSV from HSN earlier this year but still had a supply at home and only opened it recently. I struggled each morning, thinking that my taste buds were just not awake, until I realized the formula had been changed. Oh my, what a HORRIBLE change, gritty, bland, nothing like my favorite coffee shake in the world - the one that rivaled 'coolatas' from DD and other icy cold coffee drinks. Now I am stuck with 200 servings of a coffee shake that I can barely tolerate. I've been a customer for years - through HSN and this website and can't tell you how very disappointed I am. THE COFFEE FLAVOR WAS MY FAVORITE BUT I JUST RECEIVED MY TODAYS SPECIAL IN THE COFFEE FLAVOR & IT TASTES WAY DIFFERENT FROM THE ONE I HAVE IN MY CABINET. PLEASE GO BACK TO THE ORIGINAL. GO BACK to the old formula!!! PLZ!! I, like many others, am VERY disappointed with this new formula. I used to look forward to my shakes and now I can hardly get them down. The formula taste different, smells different, has a higher caloric value, and still has the same amount of artificial sweeteners. I could see if they took out the artificial sweetener and had to deal with a less tasty product, but with all those ingredients the same, I am disappointed. Bring back the old formula or find a new one WITHOUT the artificial sweeteners. As for coffee taste, do not expect a genuine coffee taste, you will be disappointed with this new formula! The old one, mixed with milk and ice cubes, shook up real well, would taste like the cold coffee drinks in stores (Starbucks kind). No such luck with this one...YUCK! I used to love this in the morning and would look forward to each morning. Now this change has me not ordering this at all. It smells differently too, not like true coffee. Please go back to the old way or improve this new formula to taste like the original. Indulge yourself with a super rich, super creamy refresher that's super good for you! This smoothie packs plenty of Protein and Potassium to restore your vital resources. Blend ice and water in a blender. With blender running at lowest setting add Secure®, banana and Vanilla Wafers. Replace cover and increase blender speed setting. Blend 20 seconds or until no large ice cubes remain. Now you can enjoy all the taste of America's favorite dessert with none of the guilt! Mom would approve. Blend ice, water and apple in a blender. With blender running at lowest setting add Secure®, apple pie spice, and vanilla wafers. Replace cover and increase blender speed setting. Blend 20 seconds or until no large ice cubes remain. Savor the dreamy taste of a Creamsicle® in a glass! But this drink is high in both Fiber and Vitamin C so you can enjoy it any time with no remorse. Blend ice, water and orange in a blender. With blender running at lowest setting add Secure®. Replace cover and increase blender speed setting. Blend 20 seconds or until no large ice cubes remain. Liven up your day (or night) with a taste of the tropics. This island treat is both delicious and nutritious. Blend ice, water, pineapple and coconut extract in a blender. With blender running at lowest setting add Secure®. Replace cover and increase blender speed setting. Blend 20 seconds or until no large ice cubes remain. Satisfy your sweet-tooth without undermining your diet. Sheer sophistication by the glassful. Blend ice, water and cherry extract in a blender. With blender running at lowest setting add Secure® and cocoa. Replace cover and increase blender speed setting. Blend 20 seconds or until no large ice cubes remain. Your taste buds will revel in an explosion of flavorful strawberry delight. What's the surprise? It's good for you and has berry, oops, very few calories. Blend ice, water and strawberries in a blender. With blender running at lowest setting add Secure®. Replace cover and increase blender speed setting. Blend 20 seconds or until no large ice cubes remain. Enjoy a tart-sweet, lemony refresher any time. Tastes better than high-calorie, diet-busting snacks. Blend ice, water and lemon juice in a blender. With blender running at lowest setting add Secure® and cookies. Replace cover and increase blender speed setting. Blend 20 seconds or until no large ice cubes remain. Treat yourself to a delicious taste of the Florida Keys. You get all the flavor and none of the guilt! Blend ice, water and limejuice in a blender. With blender running at lowest setting add Secure® and cookies. Replace cover and increase blender speed setting. Blend 20 seconds or until no large ice cubes remain. Keep telling yourself this delicious shake is jam-packed with protein and antioxidants! Otherwise the rich, creamy flavor and texture might just make you feel guilty for no reason. Blend ice, water and peppermint extract in a blender. With blender running at lowest setting add Secure® and cocoa powder. Replace cover and increase blender speed setting. Blend 20 seconds or until no large ice cubes remain. Ingredients: Non-GMO Soy Protein Isolate, Fructose, Non-dairy Vegetarian Creamer (Trans Fat Free), Maltodextrin (soluble dietary fiber), Calcium Citrate, Calcium Citrate Malate. Contains 2 Percent or less of: Natural & Artificial Flavors, Magnesium Oxide, Calcium Ascorbate, d-alpha Tocopheryl Acetate, Acesulfame Potassium (non-nutritive sweetener), Natural Beta-Carotene, Sucralose (non-nutritive sweetener), Potassium Citrate, Niacinamide, Calcium Pantothenate, Zinc Citrate, Folic Acid, Selenium-Methionine Complex, Cholecalciferol, Pyridoxine Hydrochloride, Cyanocobalamin (Proprietary Protective B12 Matrix), Thiamin Hydrochloride, Riboflavin, Molybdenum Glycinate, Chromium Nicotinate, Potassium Borate, Biotin, Manganese Citrate, Vanadyl Sulfate. Contains Soy.